Of late public taste has been turned to the advantageous effect of grasses in landscape gardening. Ferns had the credit of first winning attention from colour to form, and grasses next stepped in to confirm the preference for grace and elegance over gaudy colouring…. So wrote Margaret Plues in her book British Grasses (1867) which just goes to show that ornamental grasses have been around for much longer than might be thought. Leafing through her book, grasses have certainly come a long way since then. Over a century later there’s a wider range available, in fact there’s a mind-boggling choice of garden worthy grasses on offer. 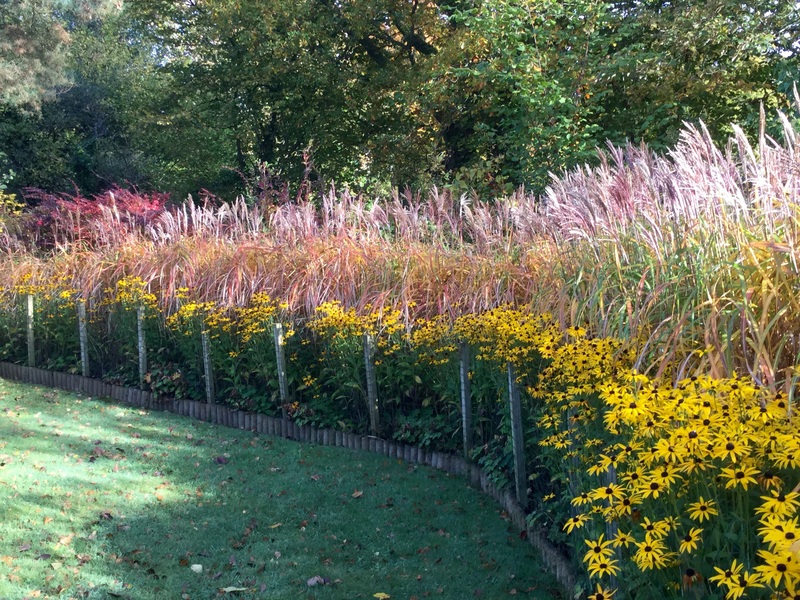 Taller forms of Miscanthus sinensis have been grown for generations, but it wasn’t until the middle of the 20th Century that European gardeners could rely on a range bred for flowers as well as foliage. I used to think Gertrude Jekyll was a bit of a colour-fixated, humourless bossyboots until I came across her fun-loving doodles. Particularly this one : liking cats, I warmed to her. What’s always interested me is despite the fact that she had one foot in either century she used grasses with imagination. In her book Colour in the Flower Garden, (1908, page 113), Jekyll describes a couple of her own colour coordinated garden rooms at Munsted Wood in detail, border by border, plant by plant. The Blue garden contained the “great white-striped Japanese grass, Eulalia japonica striata [Miscanthus sinensis Variegatus] planted behind the delphiniums” and in the Green garden “in the angles again are Eulalias, but these are the variety zebrina [Zebrinus or Zebra grass] with the leaves barred across yellow”. Compared to how grasses were otherwise being grown this was quite progressive, at the time large grasses had curiosity value but tended to end up marooned in a lawn as isolated specimen plants or lumped together in a grassery. My impression is that in the UK this tradition lasted until at least the 1980s. Jekyll employed miscanthus with flair beyond her garden gates, using the elegantly upright form of ‘Gracillimus’ as vertical accents in the Great Plat at Hestercombe, one of many gardens to enjoy her collaboration with the architect and fellow cartoonist Edward Lutyens. 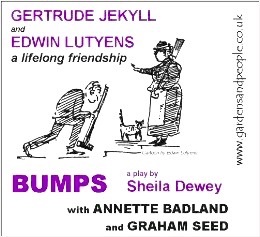 It seems they held each other in fond regard and had nicknames for each other, his for her was “Bumps” based on her “mother of all bulbs” figure, used for the title of a play by the same name. She must have had a soft spot for “Lut-Luts” for him to have got away with that. 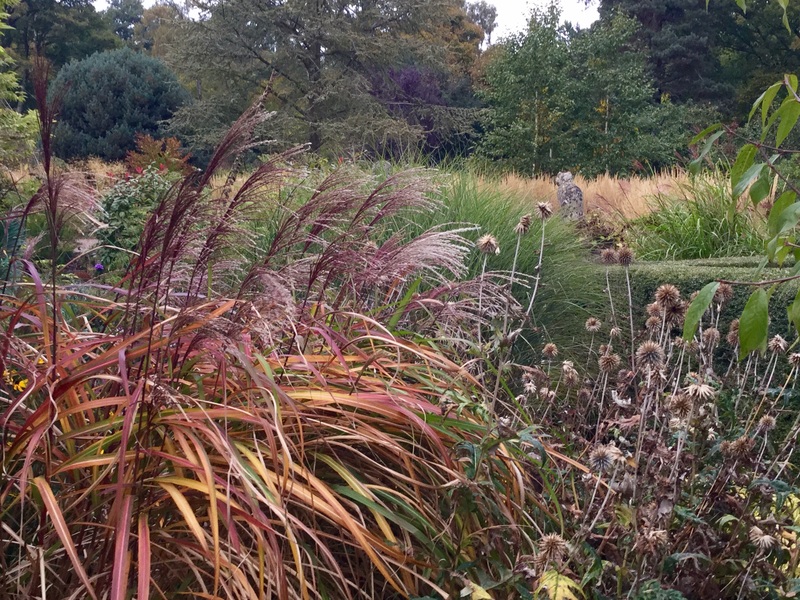 Modern British gardeners seduced by images of free flowering miscanthus may be disappointed to find that only in the most exceptional years will either older or modern variegated cultivars flower. From start to finish, 2014 was one such exception for three outstanding variegated ones shown in the image above, from left to right they are ‘Morning Light’, ‘Cosmopolitan’ (both American introductions from Japanese cultivars) and ‘Zebrinus’ (the antique favourite). All three flowered but I was so unsure I liked the effect that I was tempted to snip them off! Prior to the tireless work of one greatly determined man in the 1950s, there were only a few cultivars that could be counted on to flower in European climates. For some, the most famous of the traditional early flowering cultivars to predate his work ‘Silberfeder’ is still hard to beat. 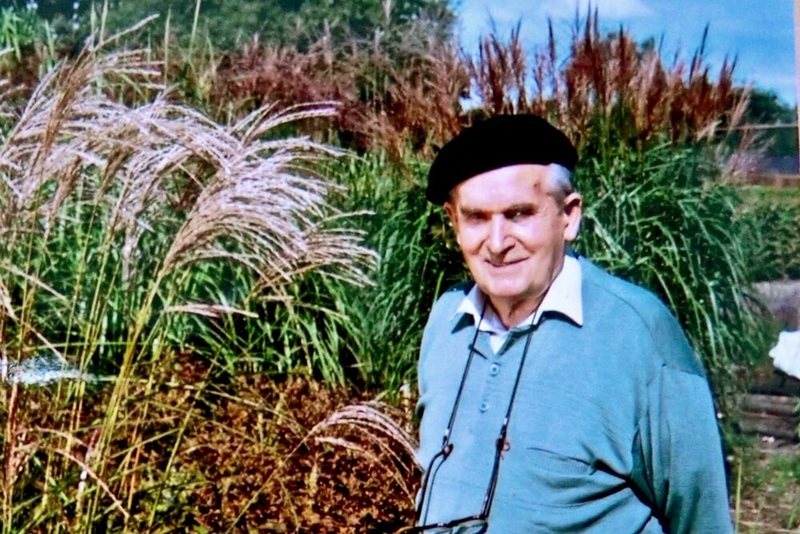 Ernst Pagels (1913-2007) is the hero of many garden worthy herbaceous perennials but it’s his pioneering work with Miscanthus sinensis that interests me most. His nursery in Leer on the Dutch-German border was ringed in grasses, I’d love to have seen it. He took ‘Gracillimus’ and wooed it not just to flower but to produce ripened seed under glass. Over many years his painstaking efforts with the variable seedlings resulted in numerous cultivars we recognise today, all were selected for hardiness combined with a free flowering habit. Among his lengthy honour roll are ‘Kleine Fontaine’, ‘Flamingo’, ‘Graziella’ … and so on. 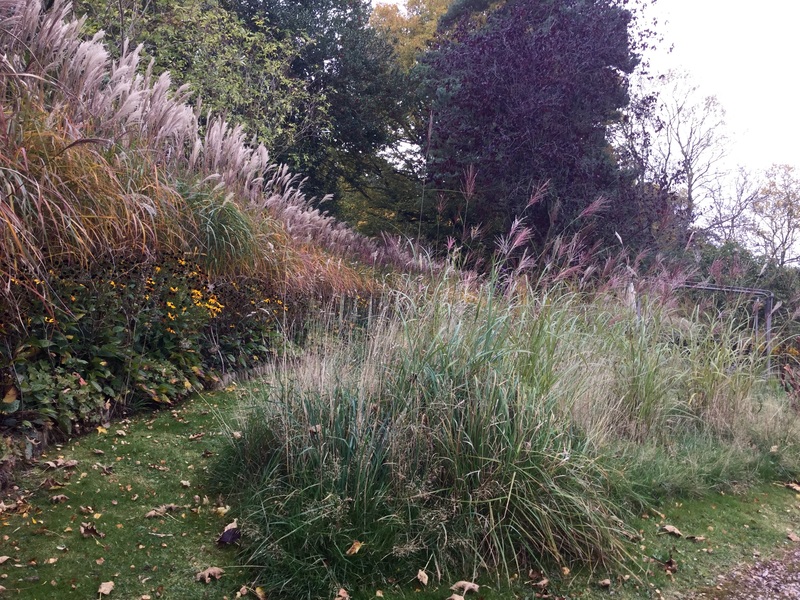 The RHS Miscanthus Trials bulletin published in 2004 records Pagels’ lifelong commitment, he not only “submitted a great number of cultivars from his own raising and selection, but also gave invaluable notes on their characteristics”. 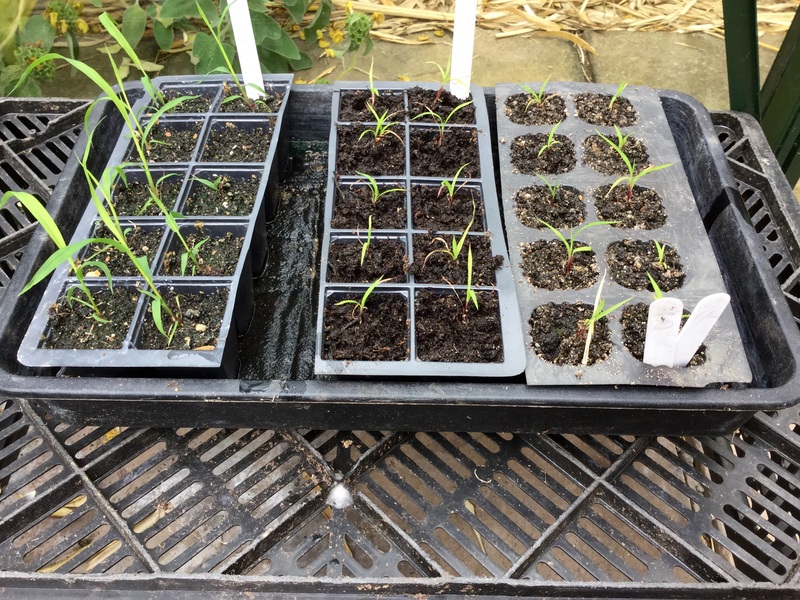 For people like me growing Miscanthus sinensis from seed is not easy but it’s fun to try. The genus has its origins in Asia and requires much higher temperatures and light levels for a far more extended period than is matched by temperate climates. Countless times I’ve read miscanthus doesn’t even make a move until temperatures reach about 26 C. Based on my experience, I think that’s a generalisation, perhaps it depends on the cultivar and where it’s positioned – on the South Wales border we rarely enjoy more than 20 C until mid summer, and then only for short bursts. Even so, the foliage mounds of the taller cultivars I grow are at a good enough height to all but engulf Alium Purple Sensation by June. What I do notice is that in a good year only one early flowering and especially vigorous cultivar, ‘Kascade’ self seeds which suggests to me that a later start inhibits seed setting rather than the plants ability to flower, let alone produce handsome foliage in the meantime. 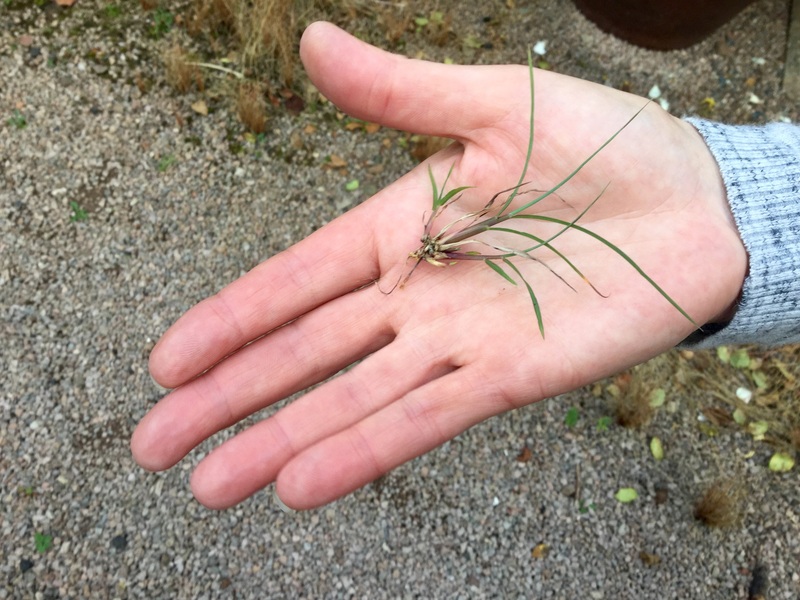 One significant bonus of the relatively shorter growing season is that unlike some cool season grasses native to Europe miscanthus won’t trouble UK gardens with unwanted seedlings. Given the hundreds of ‘Malepartus’ I grow, perhaps that’s just as well 😉. This year even though conditions are not quite back to ‘normal’ there’s still a clear division between the flowerers and the non-flowerers. Of the 30 cultivars I grow only those I’d expect to flower are doing so, to be honest, some with a little less gusto than I’d like. From a distance the lower stretch of the west facing 200 foot long ‘Malepartus’ hedge looks fine, you have to examine small sections to see how variable growth has been this year. In the image above those planted to the right in full sun are happy compared to those to the far left planted in the part shade cast by a trio of copiced silver birch 5 metres away (out of view to the left in the lawn). Close to, this section is shorter, plus the plum coloured plumes that should be silvering by now, are still coloured and so less developed even though the leaves are turning. For mature stands of a robust cultivar like this to stall and go into early dormancy shouldn’t be a problem next year, but it might be a test of hardiness for less vigorous juvenile cultivars in the first year of planting. Furthermore, I’d guess that if a poorer start is followed by a prolonged wet winter then the problems might be compounded, at the very least, it might set them back. As a family Miscanthus sinensis has a wide range of distribution across Asia spanning valley lowlands to high altitudes, snow cover itself isn’t a problem and even acts as an insulator. Drainage requirements are probably key and relative to locale, soil type and seasonal variants. Although happy to grow in heavy clay in all but the boggiest sites, it never hurts to add fine grit or a lighter loam when planting. Larger divisions establish faster than either small ones or equivalent 2 litre purchases. These dozen surplus 15 litre divisions of Kascade’ have survived the first year of being planted to add texture to the rough grass (to the right) but I wouldn’t risk it with anything smaller let alone more precious. The relative dip in temperatures is partly responsible for this year’s amazing fanfare of autumn colour, in woody plants. Even if it’s put some of the warm season grasses to sleep, it’s also set their leaves ablaze. Varieties such as ‘China’ and ‘Malepartus’ aren’t renowned for this sort of seasonal display but the potential must be in the genes as there are some like ‘Purpurescens’ that have been selected for exactly this characteristic. In its native land Japanese Silver Grass has been revered and cultivated for centuries as an important thatching material, fodder crop and ornamental garden plant, so it seemed only right to plant one to complement Acer palmatum overlooking the greenhouse. Interestingly, as elsewhere in the garden, along with dwarves and variegated cultivars, these leaves are still verdant. The leaves are certainly spectacular, I hope it doesn’t set them back for next year. Thanks, Jessica, I’m sure they’ll be okay, just a very odd sight after all these years of growing them. 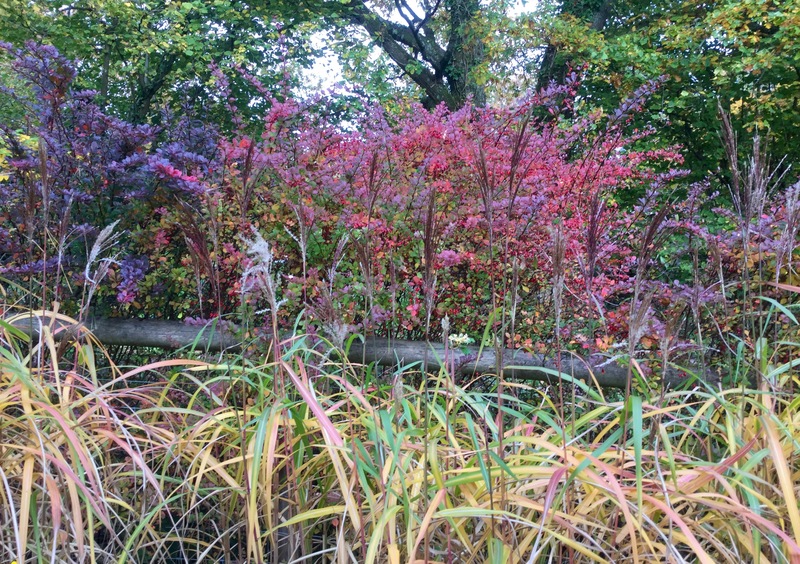 I wonder if other people are seeing them same bursts of colour in their miscanthus? Hope your toe is on the mend, having trouble accessing your website today so leaving well wishes here. Trouble may our end, glitches following an update. Love the Ernest Pagels total dedication to grasses and indeed yours too. It’s very helpful to have your images and experience as a reference for what works with what. Thanks, I’m pleased you like the story of grasses too. It’s a shame there’s not more information about the amazing group of German nurserymen/women’s and designers, most sources are in German. 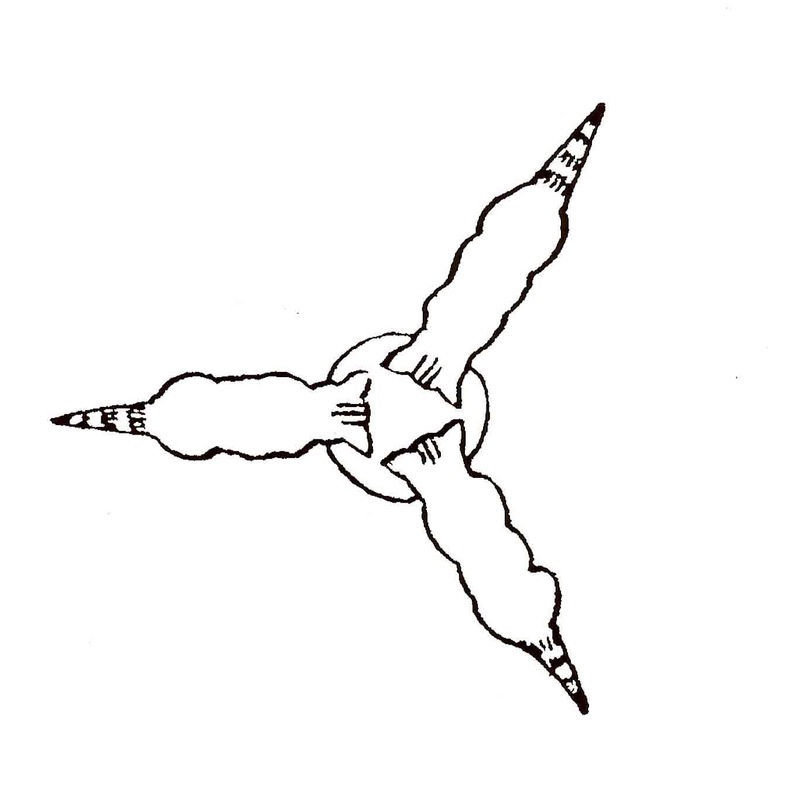 The recent Ouldolf book ‘Hummelo’ is one of the best sources. Quite often what doesn’t work is even more useful and interesting than what does! I’ve made so many mistakes, I’m forever apologising to my plants. Miscanthus make a great contribution to the garden, I was very disappointed when ‘flamingo’ failed to return one spring. Wonderful autumn colour in the last picture. I wouldn’t be without taller cultivars, they’re great plants and, as you know,fine additions to both the garden and formal arrangements. Sorry to hear your Flamingo went AWOL, it’s a lovely one with execptionally coloured, drooping plumes and usually reliable. Hasn’t it been an amazing autumn! Brilliant post, thank you. 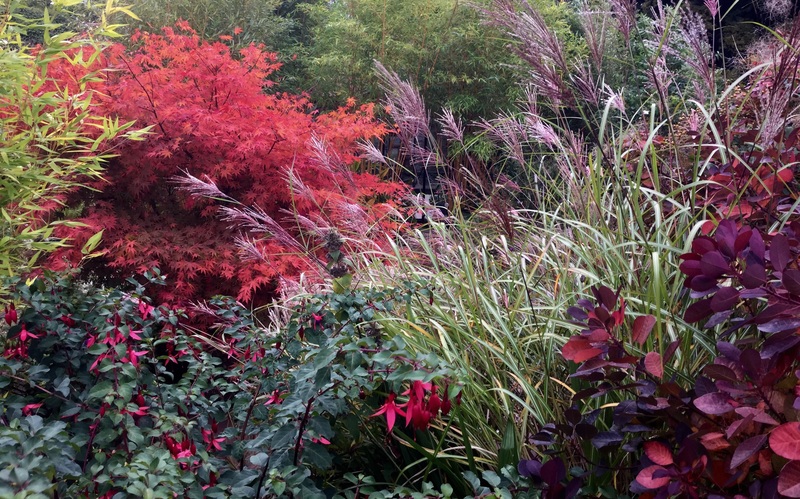 I love Miscanthus although they only just survive the heat and drought. ‘Morning Light’ flowers most years here although in my UK garden I don’t think it ever did. Not a problem anyway as the form is lovely. I love your Malipartus hedge- it is inspiring. ML is such an elegant, luminous plant. I do notice that not all stands of the clones I grow are as strong as others, they seem to vary according to conditions, even if shorter/thinner they’re are still attractive. Thank you for your kind word about the hedge, it was a bit of a gamble but has been such a beautiful alternative to a traditional one.